It was a week when one local lady, from Padiham to be exact, had appeared in court on motoring charges after four people were killed in an accident on the M6 motorway. The lady in question had decided to use the M6 despite knowing her car was in such a poor state that it was only capable of being driven at speeds up to 20 miles per hour. Once on the M6 she pulled over when there appeared to be a problem with the vehicle. Realising she was some 200 yards from an emergency phone and not wanting to get wet in the rain, she decided to drive down and pulled straight back into the inside lane without a thought. Unfortunately that forced her into a collision with a car driven by the Rev Samuel Gough, his wife and two sons, all of whom were killed. She told the court she was prepared to plead guilty to careless driving but the prosecution would not accept that. Four charges of causing death by reckless driving were brought to which she pleaded not guilty. Over the previous few weeks the friends and neighbours of 64-year-old George Howley had been getting increasingly concerned. Mr Howley had gone missing. He'd been depressed and said he was going to harm himself. They feared the worst but it wasn't quite the story. Mr Howley had actually done a runner after being summoned to court. He got as far as the court door but fled. In this week in 1991, he'd been found and appeared after being charged with indecently assaulting a boy over a period of months. The court were told he'd tied the boy up on one occasion. He was told there was no other alternative to a custodial sentence and was given fifteen months imprisonment. One crime in town had left an 82-year-old man very upset indeed. The neighbours of Mr Edward Morville were disturbed by noises when his house was broken into. The thieves stole his cockatiel which had been a golden wedding present for him and his late wife Mary. "I loved that bird," Mr Morville said. "I talked to it all the time and we became real friends. It has been so good for me and ever since my wife died he has been wonderful company." "I would talk to him rather than watch the television," he added. "All they have left me with is one white feather." Relatives hoped to replace the bird but weren't able to afford the cost of a new cockatiel for Edward. In local education, Habergham High School had decided to opt for independence and by a substantial majority when the governors voted although chairman Mr Jim Sanderson said the parents would have the final say. I'm not sure whether these two boys attended Habergham, but it wasn't a good time for either. A 16-year-old had to have a metal plate fitted to a fractured eye socket following an unprovoked attack by a 14-year-old. Whilst one was receiving important treatment, the younger boy pleaded guilty to grievous bodily harm and the hearing was adjourned for social inquiry reports. There were a lot of excited schoolboys at the Thompson Centre which was packed for a model railway exhibition run by Burnley Model Railway Society. Whilst the Burnley Express featured local boy Luke McKavett, there were visitors from as far afield as Stroud (Gloucestershire), Buxton (Derbyshire) and Bradford with two visitors going home with the big awards. Mr John Jowett was the proud winner of the Margaret Lomax Memorial Shield for his imaginatory and unique tipping device which formed part of the extensive model railway he kept in the cellar of his home. The most scenic item was shown by Mr John Womersley who went home with the Bob Andrew Memorial Tankard. It was the sign of the times as Burnley & Pendle announced that smoking on their bus services would be banned from the beginning of December. Smoking, at the time, was permitted on the upper deck of buses. Two of Burnley's players endured a marathon autograph session. They were David Hamilton and Jason Hardy who were at Sainsbury's and signing autographs for donations towards arthritis research. They signed many autographs and raised a large amount but the big day for our players was Saturday with top of the league Mansfield coming to town. Burnley went into this game looking to equal a club record. Since Jimmy Mullen had taken over as manager we'd won no less than seven consecutive games, one short of the club record set 23 years earlier in 1968. Coincidentally, the last win of the eight in 1968 came on 9th November, and here we were again, on the same date, looking to equal it. This was a tough one, against a Mansfield Town side whose only defeat was at home to second place Barnet back in August. Ahead of the game, Jimmy Mullen said: "We have won seven on the trot and they haven't lost away from home. That sets the game up nicely and it should be a real humdinger. "I think that the crowd realise that we are trying to give them the sort of excitement that they are looking for. I have changed the system and changed the style a little bit and tried to make things a bit more direct. All I have asked of the players is that they are more positive. "The public in Burnley and the supporters of the club expect great things, especially in home games, and they think we should put teams under pressure from the start. I am playing with two wide men and trying to be more positive." 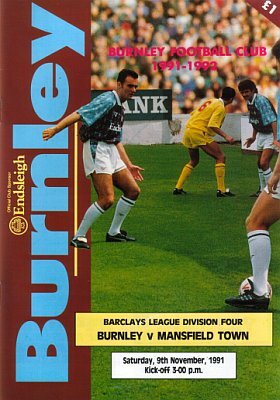 Burnley were still without Ian Measham and Paul France continued at right back. On the bright side, Roger Eli was fit enough to return to the bench for a game played in front of our first five figure attendance of the season. It was the third game of the month, having already beaten Halifax Town and York City, but there is no doubt that the prize scalp was Mansfield who kicked off a point clear of Barnet at the top with a game in hand. It proved to be a terrific game in which Burnley three times took the lead, and had to before winning the game 3-2 against a Mansfield side who were undoubtedly the best we'd played so far, although such was our performance that we could have won more convincingly. We were in front after just seven minutes and it came from a peach of a pass from John Deary for John Francis who stormed down the inside right channel and then towards goal. He clashed with Mansfield goalkeeper Jason Pearcey. Was it a trip? Francis was still on his feet but he got his penalty and up stepped Mike CONROY who sent Pearcey the wrong way. Burnley were ahead. With just about half an hour gone, it was all square. We should have done better defensively as Steve WILKINSON and Phil Stant combined for the former to net. It was neatly done, a gem of a goal, but questions were asked in the Burnley defence. It was 1-1 at half time but Burnley started the second half really well. We won three corners in the first ten minutes of the half and regained the lead from the third. Joe Jakub took the corner and was looking for Steve DAVIS who headed Burnley back in front, just beating the 'keeper to the punch. It was end to end stuff. Graham Lancashire was inches wide at one end before Wilkinson shot straight at Andy Marriott at the other. Francis had a chance to double the lead but blazed over. Then when Davis and Pender got in each other's way they paid the price. 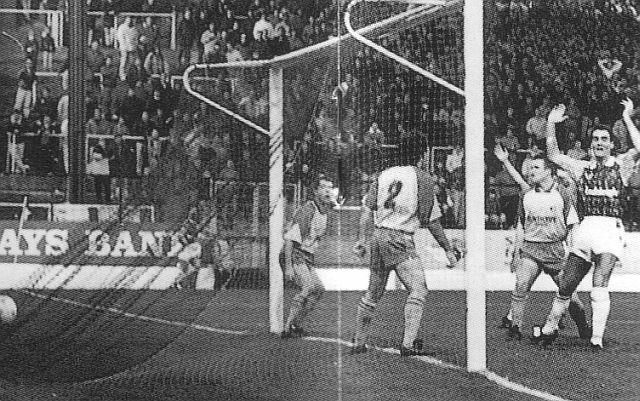 It was a second WILKINSON goal and it was not often you saw Steve Davis and John Pender on different wavelengths. Into the final ten minutes and Burnley were searching for a winner, and then, with seven minutes to go, we won another corner on the right. Jakub swung it towards PENDER and it was Captain Fantastic with what was surely the winning goal. It was the winning goal, it was a deserved winning goal, and this had been Burnley's best performance of the season, indeed Burnley's best performance for quite some time. "It was a cracking game," beamed Mullen, fast becoming a real Burnley favourite. "I said all along that two of the top three playing each other promised to be a cracking game and it didn't let anyone down. I'm so glad that we finished on the right side of the scoreline"
Burnley were still third in the table as the league season took a break for the cups. 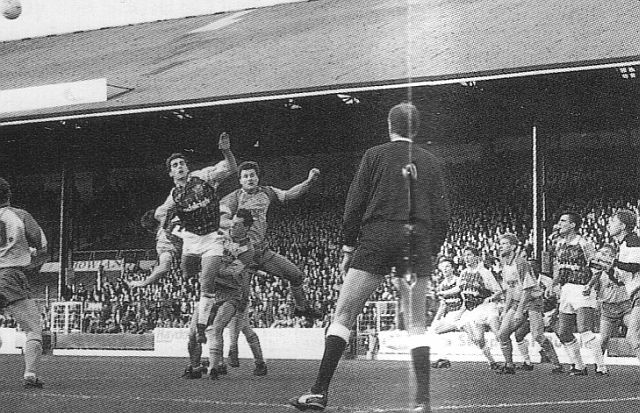 Before we would play another league match, and the next was at Maidstone, we had two home cup ties to come against bottom of the table Doncaster Rovers, one in the FA Cup and one in the Autoglass Trophy. Burnley: Andy Marriott, Paul France, Joe Jakub, Steve Davis, John Pender, Andy Farrell, Steve Harper, John Deary, John Francis (Roger Eli 76), Mike Conroy, Graham Lancashire. Sub not used: Mark Yates. Mansfield Town: Jason Pearcey, Paul Fleming, Cliff Carr, Steve Spooner, Greg Fee, George Foster, Gary Ford, Paul Holland, Phil Stant, Steve Wilkinson, Steve Charles. Subs not used: Ian Stringfellow, Wayne Fairclough. This result took Mansfield off the top of the league for the first time since they replaced Blackpool in mid-October. Barnet, 3-0 winners against Halifax Town, were the new leaders with two points more than Mansfield who themselves were two points clear of Burnley. Suddenly the league table was opening up and we now had a seven point lead over Hereford United who were one place behind the play offs. The four clubs in those positions were Blackpool,. Rotherham United, Rochdale and Scunthorpe United. Doncaster Rovers still occupied the bottom and relegation position, and were two points behind Aldershot.